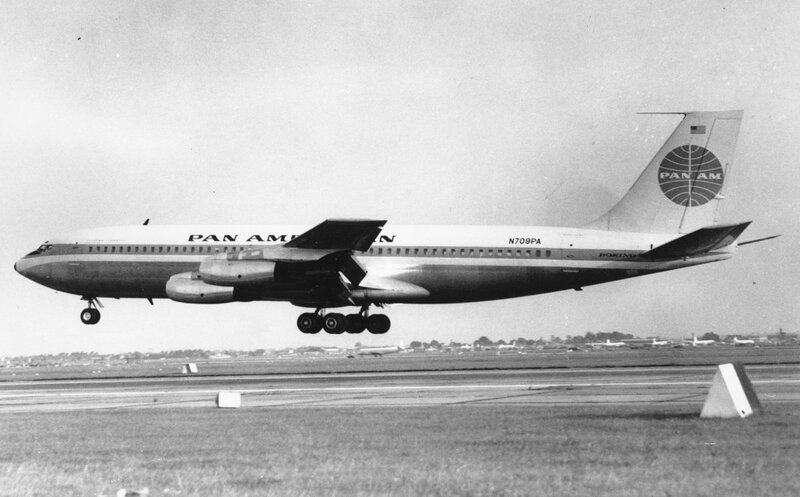 On 15 August 1958, Pan American World Airways took delivery of Boeing’s Construction Number 17588, a 707-121 registered N709PA and named Jet Clipper America (later changed to Jet Clipper Tradewind). This event ushered in what became the Jet Age. The story leading up to that delivery was typical Juan Trippe, Pan American’s leader who, although the idea of commercial jet travel did not become viable until well into the 1950s, explored the idea of jet propulsion during World War II, along with Charles Lindbergh and Pan American’s Chief Engineer Andre Priester. 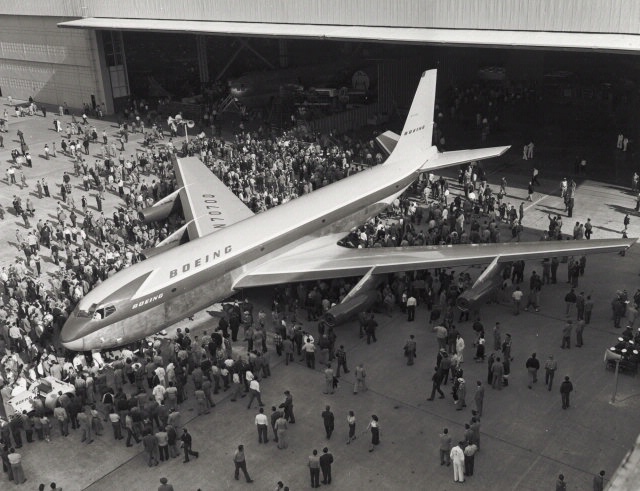 The 707 was developed from the Boeing 367-80, a prototype jet that made its maiden flight on 15 July 1954 from Renton Field, the 38th anniversary of the Boeing Company. According to the Boeing website, production go-ahead for the Dash 80 was announced by Boeing 30 August 1952, as a company-financed $16 million investment. The airplane rolled from the factory less than two years later, on 14 May 1954. “Powered then by four Pratt & Whitney JT3 turbojets, mounted under wings swept back 35 degrees, the Dash 80 established the classic configuration for jetliners to come. It also set new speed records each time it flew. This was illustrated 11 March 1957, when it flew from Seattle to Baltimore in 3 hours 48 minutes at an average speed of 612 mph. “The Dash 80 was retained as a Boeing test aircraft and underwent major structural and aerodynamic changes in the course of developing and testing advanced aircraft features. Many test programs were aimed far beyond aircraft flying today, such as airborne simulation of flight characteristics and systems concepts for a U.S. supersonic transport. “The Dash 80 flew with a fifth engine mounted on the aft fuselage to test installation feasibility for the trijet 727 and with three different types of engines installed at the same time. It investigated engine-thrust reversers, engine sound suppressers, rigs designed to cause in-flight engine icing conditions, air conditioners, and wing flap and slat modifications. “It was also used to test radar and radar antennas, and even different paints. In one test series for landing gear, the 707 prototype was outfitted with oversized tires; it landed and took off from mud fields barely able to support the weight of passenger automobiles. “The 707 prototype also flew special landing-approach studies at Moffett Field, California, for the National Aeronautics and Space Administration. A high-lift, slow speed system featuring special wing flaps for direct-lift control was used in steeper-than-usual landing approaches designed to alleviate community noise in airport areas. “During its early years, the airplane was the center of attraction in the aviation world, giving many airline pilots, airline executives, and military and government officials their first taste of jet flying. It has approximately 3,000 hours of flight recorded in its logbook. 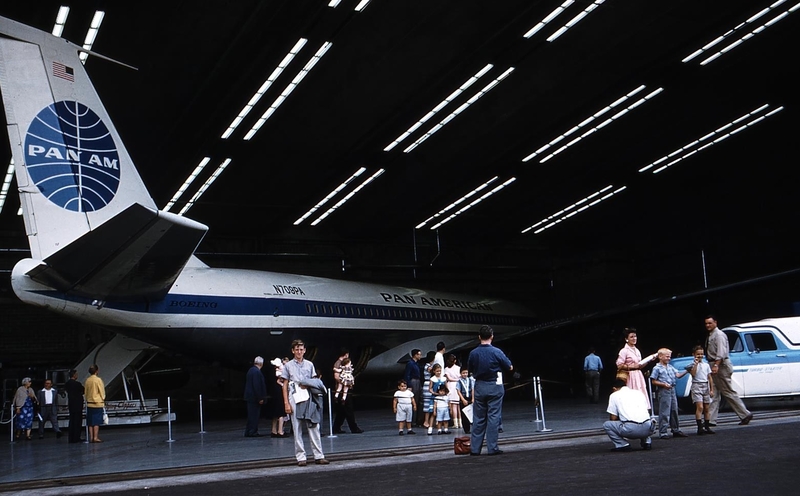 “The prototype led to a revolution in air transportation and it gave gave birth to the 707 series of jetliners. Much larger, faster and smoother than the propeller airplanes it was replacing, it quickly changed the face of international travel. As part of the Dash 80’s demonstration program, Boeing CEO Bill Allen invited representatives of the Aircraft Industries Association (AIA) and International Air Transport Association (IATA) to the Seattle 1955 Seafair and Gold Cup Hydroplane Races held on Lake Washington on 6 August 1955. The Dash 80 was scheduled to perform a simple flyover, but Boeing test pilot Alvin “Tex” Johnston instead performed two “barrel rolls” to show off the jet airliner. The next day, Allen summoned Johnston to his office and told him not to perform such a maneuver again, to which Johnston replied that he was simply “selling airplanes” and asserted that doing so was completely safe. As mentioned above, Juan Trippe, Charles Lindbergh and Pan Am Chief Engineer Andre Priester explored the idea of jet propulsion during World War II. However, the idea that jets would eventually become commercially viable did not have its genesis until the early 1950’s. Then, there was no jet airliner even in the design stage in the United States. Britain had been developing the “Comet” jet, but it lacked range. In December 1951, BOAC (predecessor to British Airways) took delivery of its first Comet, notwithstanding its poor economy and range. What Pan American wanted was a plane that could carry at least 65 passengers from New York to London at 500 miles-per-hour. In mid-1952 Pan Am engineers Priester and John Borger made the rounds to Boeing, Douglas and Lockheed. What was seen was disappointing. The manufacturers, however, soon began focusing on a commercial jet because by September 1952, jet airliners had become inevitable. 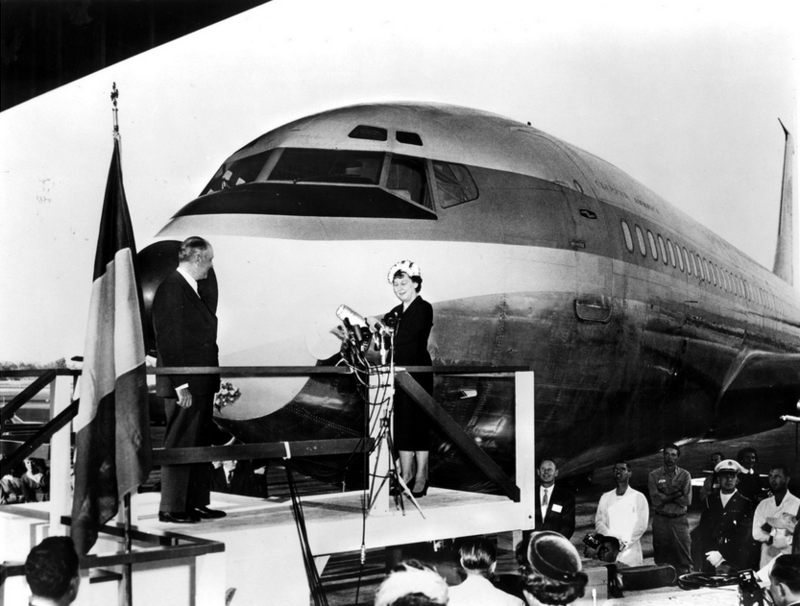 Boeing developed the Boeing 707 prototype as described above and Douglas was working on its DC-8 project. At the same time, the turboprop engine had been developed and airlines were lining up for the likes of the Lockheed Electras and British Viscounts. Pan Am was not in the line because its engineers were of the opinion that propellers were the cause of most mechanical breakdowns. Other problems had to be dealt with, most foremost were the lack of airports that could handle jets, lack of fuel to “feed them”, lack of tugs to tow them, lack of suitable stairways and lack of adequate hangers to overhaul their engines. Other issues included the engine to be used, the size of the aircraft and its range, and its economics, pitting the air-frame manufacturers, the engine manufacturers and Pan Am on seemingly a collision course, given the different needs of each group. 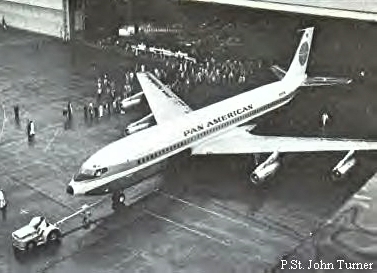 “Pan American again pioneered in closing, in October 1955, purchase agreements for a fleet of long range jet transports at a cost of $270,000,000. Equipped with four jet engines of 14,000 pounds thrust each, these Clippers will carry 150 passengers to Europe at 600 miles per hour. The new jet fleet will telescope greater technical advance in speed, comfort, range and capacity than achieved over the past thirty years. “In April, 1958, Pan American inaugurated transatlantic Economy class service offering fast, comfortable transportation at a greatly reduced fare. Whereas the roundtrip fare between New York and London was $783.00 First class, and $567.00 Tourist class, the new Economy class fare was $453.00. “Economy class service increases aircraft seating capacity by use of close seat spacing required for that new class…Luxury services are curtailed. Economy class service, sponsored by your company, again emphasizes the leadership in expanding air travel by bringing it within the budgets of more and more people who heretofore could not afford to travel abroad. “Over 100 transatlantic Clipper flights per week are scheduled during the 1959 season, all offering Economy class service. Jet Clippers will operate 50 of these flights with the remainder being flown with long-range Super-7 Clippers”. Thus, while the Jet Age also ushered in a class of travelers known as the “Jet Set”, it also ushered in the opportunity for overseas travel to the mass market and created the international tourist. In the next posting, the stories of the Boeing 720 and what Ron Davies referred to as “one of the great airliners of all time”, the Boeing 707-321 will be told. The Book Pan American World Airways – Aviation history Through the Words of its People contains 71 stories written by the people of Pan Am who played important roles in many of the important events in Pan Am’s history. The book is published by BlueWaterPress. For a companion book with a timeline of Pan Am history and images of aircraft, timetables and other memorabilia, see a preview of Pan American World Airways – Images of a Great Airline. The book is also available directly from the publisher, BlueWaterPress or Amazon.